North Carolina Barbecue: Welcome to NCBBQ.COM, where the experts gather to discuss North Carolina Barbecue! Welcome to NCBBQ.COM, all about North Carolina Barbecue! Looking for information on North Carolina Barbecue? Then you've found the right place! 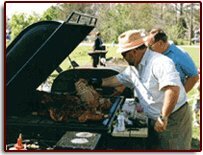 Everything about North Carolina Barbecue; including articles, competitions, restaurants and caterers, recipes and more. So sit back and enjoy all that North Carolina Barbecue has to offer. While you're here, be sure to create your free account by clicking here which allows you actively participate in the North Carolina Barbecue site and sign up for our newsletter! Think of NCBBQ as the ultimate destination for learning about and sharing your knowledge on North Carolina Barbecue. In this state, it's not just a passion, it's a culture! When someone invites you to a barbecue in North Carolina, they're not talking about cooking burgers. You better be prepared to come hungry and enjoy a heaping plate of tender pork cooked to its?finest with all the fixins. North Carolina is so passionate about its barbecue that there are even two different styles: Eastern North Carolina Barbecue and Western North Carolina Barbecue, with the line pretty much drawn at Raleigh. Generally, folks east of Raleigh (Eastern style) will cook the entire pig, chop it fine, and generously douse it with a vinegar-based sauce. On the other side of the state, barbecue means cooking meaty pork shoulders, chop it a little coarser, then serve it with a darker, sweeter tomato-based sauce. Which is better? Well that's for you to decide. But just so you know, I'm sure many of marriages have split up over their love of barbecue! Enjoy the site, ask questions, and if you're a barbecue enthusiast, please share your knowledge with others. Please feel free to use the links at the top of the page to post your recipes, submit articles, post your favorite restaurants, or ask/answer questions on the forum. Or please feel free to drop me a line with any comments or suggestions you may have at don@ncbbq.com . Now I'm off to enjoy some barbecue!